Facebook birthday wishes, oh how you have to LOVE them. So yesterday was my birthday. In case I had forgotten – my phone and Facebook reminded me. DING DING DING DING oh just everyone I haven’t talked to since Elementary school dinging my phone wishing me a Happy Birthday on my Facebook wall. Thanks for the Birthday Wishes Facebook! It cracks me up how much LOVE you get on your birthday thanks to beloved social media. I am totally guilty of posting rather than calling on birthdays. I also am someone who clicks the right hand corner of Facebook and drops a birthday wish to add to the Facebook birthday bomb people get on their special day. Now, if my Dad had Facebook – maybe he would of remembered that it was my birthday – womp womp womp. Dear Kids, your mom loves you to know end and I am promising you to never forget to call you on your birthday or skype or whatever the future of technology leads us to. Oh, and yes – I am the mom who will be following you online and yes, leave you embarassing Facebook birthday wishes. Here’s to growing old – cheers! 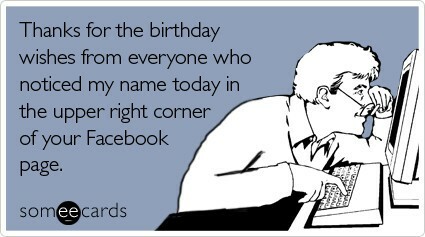 Are You Guilty of Facebooking Rather than Calling on Birthdays?